KIS is a small school situated in one of the most beautiful parts of Norway, itself one of the most beautiful countries in the world. Our student body is made up of international and Norwegian students, some of whom attend KIS long-term, whereas others are here for a shorter period of time. Whatever their background, or the intended length of stay, our aim is to welcome all of students in Grades 1-10 to an open-minded and hospitable community of learners. Our students are encouraged to think carefully about the world around them, to learn new concepts that are of global significance and to reflect thoughtfully on their own learning. 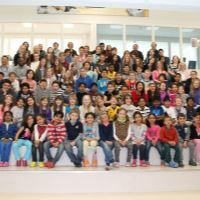 As an IB World school, authorized to offer the IB’s Primary Years Programme (Grades 1-5) and Middle Years Programme (Grades 6-10), KIS wants all of our students to become globally minded citizens who display the attributes of the IB’s Learner Profile (http://www.ibo.org/programmes/profile/). We aim to prepare our students for entry into other schools and educational establishments around the world, whatever the educational system or language. To achieve this, our students learn to be resourceful, independent learners with the ability to solve their own problems and seek help when needed. We encourage these traits by offering a rich inquiry-based curriculum. With subject knowledge not linked to any particular nationality or national curriculum, we focus on fostering in our students a strong conceptual understanding of their learning; an understanding that will be transferable to new situations and new knowledge. Lastly, our staff members work hard to make the students’ learning meaningful. An aspect of fun in the way that our students are taught provides them with the motivation needed to do well and to feel proud of themselves and their achievements. This work by our staff is repaid by our students who are positive about school and about learning and keen to do their best.